Lessons Learned and Practical Applications for Adolescent In-Patient ACT Groups Cecily Anders and John Klocek Baylor University Department of Psychology. 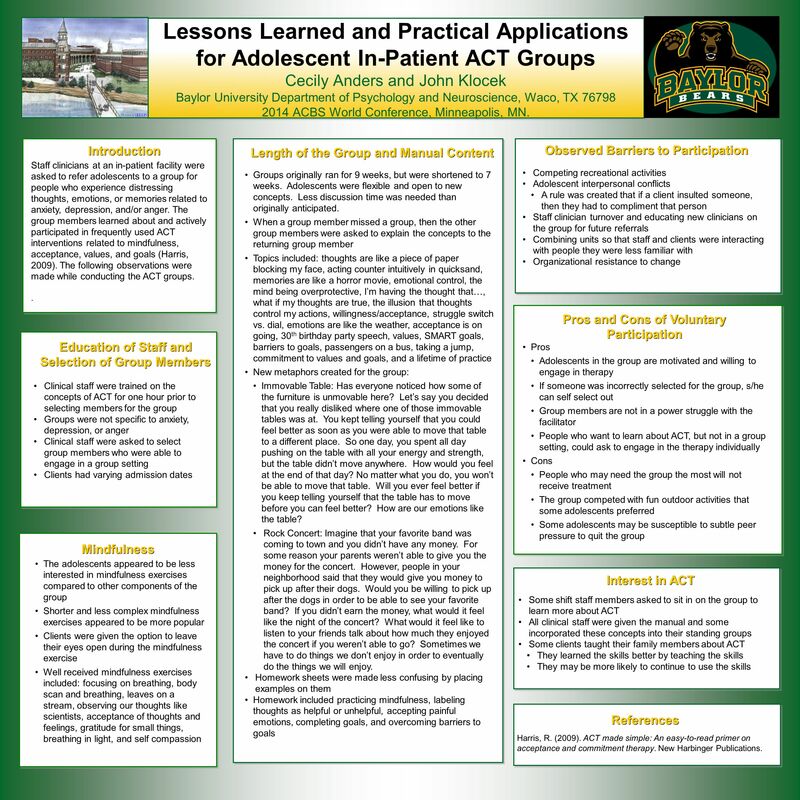 Download ppt "Lessons Learned and Practical Applications for Adolescent In-Patient ACT Groups Cecily Anders and John Klocek Baylor University Department of Psychology." “Easy Does It” for Fluency Preschool/Primary Roseman & Johnson (1998) Emily Meadows Katia Rinehart. Personal Safety & Boundary Setting Tips for Home Visitors Home Visitation Summit September 29-30, 2014. 1 Psychological Flexibility Present Moment Defusion AcceptanceValues Committed Action Self-as-context 1 The ‘New’ Self-as-context Russ Harris ACT World. Finding Hope Inside Creative Hopelessness Jennifer Villatte University of Nevada, Reno ACBS World Conference Reno June, 2010. This is the Way We Eat Our Lunch A Book About Children Around the World By: Edith Baer Illustrated By: Steve Bjorkman Cyberlesson by: Kimberly L. Fry. It begins with me… Feeling good about yourself and knowing that you deserve healthy relationships is VERY important! See the good in yourself and focus. Parental involvement in children’s education from an early age has a significant effect on educational achievement, and continues to do so into adolescence. Ole Taggaard Nielsen ACBS World Conference The ACT approach holds that clinicians must be willing to apply ACT in our own lives in order to deliver. Communication LET II. Purpose It’s not what you say, but what you do. This statement highlights the philosophy that actions speak louder than words Communicating.